Week 24: Light – When I first saw the word of this weeks photo prompt ‘light’ I automatically thought of the brightness of a sparkler against the dark backdrop of a nights sky taking me back over many memories of simple fun with the hand-held firework. The simple pleasure they give off as they leave trails of light as you wave them in various patterns that the eyes keep for longer than the sparkler burns. I came up with an idea as I experimented with night time photography. I asked my daughter Amy if she could write a word with a sparkler so that it could be read and understood in a photograph. After several funny attempts she did it. I hope you can read the word in the photo. 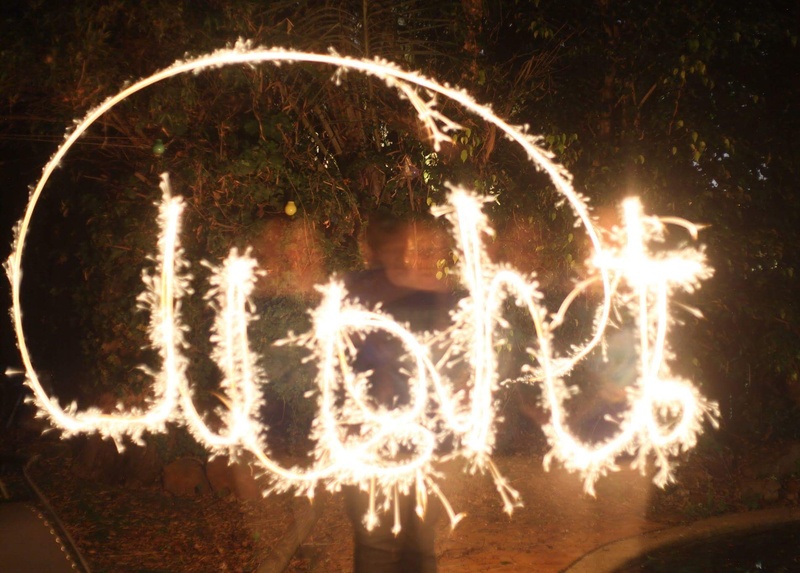 As the camera took its time in taking the photo after Amy had written the word, she had to turn her back to the camera and wait till the sparkler had finished burning. As she looked into the sparkling embers of the hand held firework she was mesmerised by the light just like when we look deep into the flames of a fire. It was peaceful and calming. I remember playing with sparklers when I was a child with my siblings and after all these years the smell of lighting one never changes. I’m sure you could close your eyes and cover your ears as one is being lit and you’d know exactly what it was just by using your sense of smell. Our own children have memories of playing with them with their cousins at family get-togethers. At the end of the night we’d get out the sparklers and watch them write their names in the sky. Playing with them with young hands sometimes meant learning the hard way – to hold onto them the correct way and not to pick them up again after the sparkles have just gone out or you might get burnt. I’ve kissed many sore fingers and hands from touching hot sparklers. A mother’s magic ‘make it better’ kiss goes a long way as the memories of getting burnt from one as a child gets forgotten as you look into its hypnotising twinkles of light. Oh how I wish I could go back in time to when I could fix things with just a kiss, one last kiss on Jacob’s hand. When was the last time you spread a little sparkle in the world – we did it the other night and felt the inner child within.